Notable roster turnover: Young team? Veteran team? Amherst: The Amherst College Army of Darkness comes into the 2013 season with nearly all of its key players returning from last year. Graduates Joseph Bobman (cousin to Middlebury’s Jesse “Lickylots” Wolf) and Ezra Van Negri will be missed, but their leadership on the field will be maintained by seniors Lock Whitney and John Yarchoan. Along with Whitney and Yarchoan, senior Alex “trophy-wife” Strecker and junior Charlie McAlister captain the squad, along with their unofficial and underpaid coach Tian Buzbee. After a losing on universe to make the championship bracket at DIII warm-ups, Amherst expects to be in the top tier all season as they realize their larger goal of making it to nationals. Dartmouth: Pain Train has high expectations for this year. We graduated 4 players from last year, all tough losses. Ian Adelstein and Lee Farnsworth, our 2 primary O-line cutters last year, are especially hard to replace considering Ian’s knowledge of measure zero discontinuous functions. However, we also returned a lot of talent and picked up a strong freshmen class. Former Pain Train captain and future doctor Ian Engler is returning for his 5th year with the Pain Train and is a force on both sides of the disc. 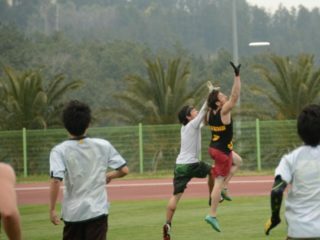 Former junior-worlds player Spencer Diamond (“Yeah Spencer Diamond!”) is a dominant cutter and incredible, albeit a little poach-y, defender entering his 3rd year with the Pain Train. Middlebury: We lost some great seniors from last year, most notably Jesse Wolf, Justin Collins, and Rob Toy. But they were pretty much all hurt by regionals anyway, so it’s kind of like if your grandma dies but she was already in a coma for six years. So it’s not really the same. This year, senior Davis “handler” Whitehead, sophomore Jason “Babyface” Milan, and junior Bill “Panta” Lones look to drive the offense, while rotating in on defense with senior Stephen “HT” Lammers and sophomore Philip “PF” Chang. Tufts: Last year we lost All Region 1st team players Alex Cooper, Piers “Red-line” MacNaughton, Sam K-S, and Jack Hatchet. 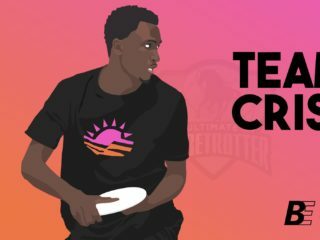 We believe, if our memories serve us correctly, Hatchet was lauded as the best defensive player in college ultimate by Skyd Mag? Honestly, we’re not surprised. Star player (and yet another 1st Team All Region player!) Adrian Banerji was a senior but has opted to play his 5th year of college eligibility by taking off two consecutive fall semesters. We are currently working with USAU so Adrian can gain a 6th year of eligibility. UVM: Very young team – lost half of team last year to graduation and more than half of our team this year are sophomores/freshmen. Most notably we lost captains and All-region players Ryan Rzepka and Jake Saunders, very skilled and important players for our team last year. Expectations for the Spring: Goals? Competitiveness? BC: We don’t really have any expectations going into this season. Harvard: Our expectations for the spring are to become the best team that Harvard Red Line 2013 can become. We are here to work hard as a unit and focus on what we can improve, both as a team and individually. Our goals for the season are to maximize our potential as a collective unit. If we do the work, the results will take care of themselves. Middlebury: We’re in the process of adjusting our goals towards becoming a consistent finalist at D3 natties. Since we’re not sure how to do this, we’ve taken a few queues from the nation’s elite college programs. We’ll be storming the field after every point, relying heavily on our pre-stall and travel calls, practicing our kick-spikes, and screening Friday Night Lights before every tournament. Up and coming players: Guys on your team that are going to be making plays come the season? Harvard: Rookie Mark Vandenberg (Paideia grad, Peer Leader, Junior Worlds champion, 2012) joins the Red Line with a deep and talented freshman line-up. Sophomore Jeremy Nixon has been putting in work and will be making some serious noise on the field as well. Middlebury: Asa Julien is a sophomore and he went to ARHS so we thought he would be good but he just talks about Star Wars and sailing instead. Tufts: Tufts Emen are a constantly growing team where even more athletes are taught how to play Tufts Ultimate. It is not uncommon for players who are a bit rough around the edges, but with great potential, to spend a season on Tufts’ C-team before moving up to the Emen. Star Players:Who would be your Callahan nominee? Who are the big play-makers and leaders? BC: We’re not a team of stars, but we are full of very above-average players. We have a great group of seniors, including Theo Mayer, Thomas Mattera, Mike Dillon, Joe Casson, and Phil Johnston that we look to make plays and provide leadership. Senior Savi Tuber is harder to catch than a powder mouse, and a worthy Callahan nominee. Middlebury: Spencer Diamond. The only way he could be better is if he attended Paideia instead of ARHS. Tufts: Big playmakers? We have two words for you: Adrian. Banerji. They should rename the Callahan award, “the Banerji award”. UVM: Sam “Unskyable” Hart is a returning all-region cutter who plays dominantly on both sides of the disc and would certainly be our Callahan nominee. In fact, they should rename the Callahan award, the “Sam Hart award”. 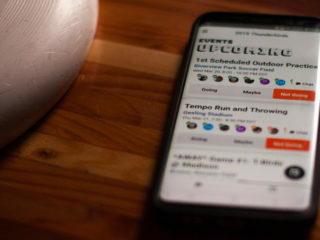 What tournaments are you planning on attending in the Spring? Apart from other irrelevant tournaments, the entire region will be going to New England Open, the debut tournament of new online tournament service, usetopscore, run by former Northeastern all-region defensive superstar Tim Spittle’s Daddy. Oh and it also serves as a preview of Regionals. Who in your region are you looking at as contenders? Teams and Players to watch that aren’t your own? UVM: I really expect Dartmouth to be the team to beat this year in the Northeast. They had a formidable team last year and I don’t think they graduated many, if any, people. Pretty scary. I also have to expect Tufts, Harvard, and Middlebury to be up there competing for the region, though I think it’ll be Dartmouth making the most noise and Middlebury’s going D-III. On these teams, Spencer Diamond of Dartmouth, Misha Herscu of Harvard, Asa Julien of Middlebury, and Gene Buonaccorsi of Tufts are players to watch out for, if you don’t mind me going all Amherst High School for this section. Middlebury: We’ll be taking our talents to d3 this year. Mostly we saw that all the teams in D-III get way more coverage online than mediocre D-I teams and that sometimes Skyd commentates their games and put them on YouTube which we think is hilarious; the glory:talent ratio is just too high for us to turn down. But actually, it made no sense for us not to declare D-III. Not only will it be better for the development of our program as a whole (publicity will add weight to our pitch for a new Friday Night Lights knock-off, starring the Middlebury Pranksters. Lookout for ‘Four O’Clock Proc’ airing on Lifetime sometime in 2014), but we can still elect to compete at d1 Regionals if we so choose. Isn’t USAU great!!! Also, despite being objectively more attractive and funnier than GOP, and their no show at our Hooters date in Charlotte last year, we still kinda like them.